For the British Javelin missile, see Javelin surface-to-air missile. The FGM-148 Javelin is an American man-portable fire-and-forget anti-tank missile fielded to replace the M47 Dragon anti-tank missile in US service. It uses an automatic infrared guidance that allows the user to seek cover immediately after launch, as opposed to wired-guided systems, like the Dragon, where the user has to actively guide the weapon throughout the engagement. The Javelin's HEAT warhead is capable of defeating modern tanks by attacking them from above where their armor is thinnest (see top-attack), and is also useful against fortifications in a direct attack flight. As of January 2019, over 5,000 Javelin missiles have been fired in combat. Javelin is a fire-and-forget missile with lock-on before launch and automatic self-guidance. The system takes a top-attack flight profile against armored vehicles (attacking the top armor, which is generally thinner), but can also take a direct-attack mode for use against buildings, targets inside the minimum top-attack engagement range, and targets under obstructions. The missile also has the ability to engage helicopters in the direct attack mode. It can reach a peak altitude of 150 m (500 ft) in top-attack mode and 60 m (190 ft) in direct-fire mode. It is equipped with an imaging infrared seeker. The tandem warhead is fitted with two shaped charges: a precursor warhead to detonate any explosive reactive armor and a primary warhead to penetrate base armor. The missile is ejected from the launcher so that it reaches a safe distance from the operator before the main rocket motors ignite – a "soft launch arrangement". This makes it harder to identify the launcher; however, back-blast from the launch tube still poses a hazard to nearby personnel. Thanks to this "fire-and-forget" system, the firing team may change their position as soon as the missile has been launched, or prepare to fire on their next target while the first missile is still in the air. The missile system is most often carried by a two-person team consisting of a gunner and an ammunition bearer, although it can be fired with just one person if necessary. While the gunner aims and fires the missile, the ammo bearer scans for prospective targets, watches for threats, such as enemy vehicles and troops, and ensures that personnel and obstacles are clear of the missile's back blast. In 1983, the United States Army introduced its AAWS-M (Advanced Anti-Tank Weapon System—Medium) requirement and, in 1985, the AAWS-M was approved for development. In August 1986, the Proof-of-Principle (POP) phase of the development began, with a $30 million contract awarded for technical proof demonstrators: Ford Aerospace (laser-beam riding), Hughes Aircraft Missile System Group (imaging infra-red combined with a fiber-optic cable link) and Texas Instruments (imaging infra-red). In late 1988, the POP phase ended and, in June 1989, the full-scale development contract was awarded to a joint venture of Texas Instruments and Martin Marietta (now Raytheon and Lockheed-Martin). 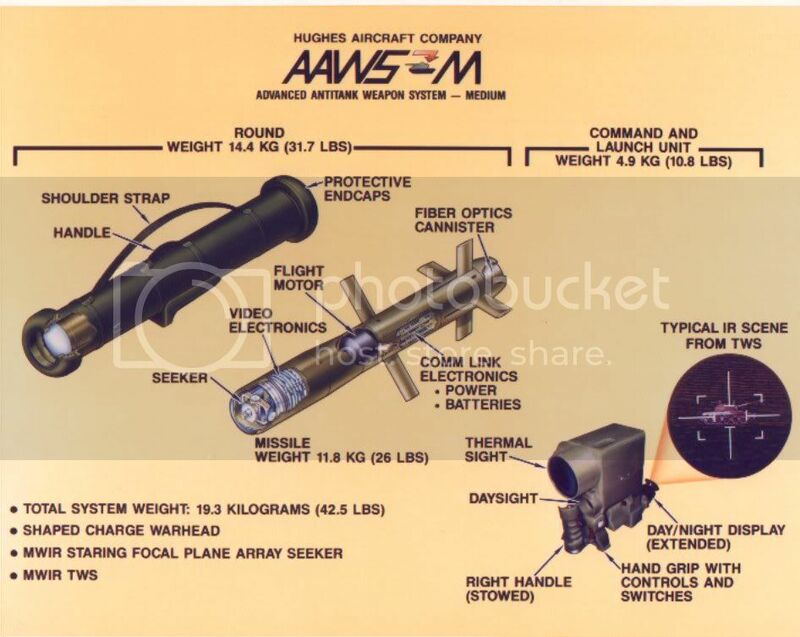 The AAWS-M received the designation of FGM-148. In April 1991, the first test-flight of the Javelin succeeded, and in March 1993, the first test-firing from the launcher succeeded. In 1994, low levels of production were authorized, and the first Javelins were deployed with US Army units in 1996. Development test and evaluation (DT&E) is conducted to demonstrate that the engineering design and development process is complete. It is used to reduce risk, validate and qualify the design, and ensure that the product is ready for government acceptance. The DT&E results are evaluated to ensure that design risks have been minimized and the system will meet specifications. The results are also used to estimate the system's military utility when it is introduced into service. DT&E serves a critical purpose in reducing the risks of development by testing selected high-risk components or subsystems. DT&E is the government developing agency tool used to confirm that the system performs as technically specified and that the system is ready for field testing. DT&E is an iterative process of designing, building, testing, identifying deficiencies, fixing, retesting, and repeating. It is performed in the factory, laboratory, and on the proving ground by the contractors and the government. Contractor and government testing is combined into one integrated test program and conducted to determine if the performance requirements have been met and to provide data to the decision authority. The General Accounting Office (GAO) published a report questioning the adequacy of Javelin testing. The report, called "Army Acquisition—Javelin Is Not Ready for Multiyear Procurement", opposed entering into full-rate production in 1997 and expressed the need for further operational testing due to the many redesigns undergone. In 1995, Secretary of Defense William Perry had set forth five new operational test initiatives. These included: 1) getting operational testers involved early in development; 2) use of modeling and simulation; 3) integrating development and operational testing; 4) combining testing and training; and 5) applying concepts to demos and acquisitions. The late-phase development of the Javelin retroactively benefited from the then new operational test initiatives set forth by the Secretary of Defense, as well as a further test conducted as a consequence of the Army's response to the GAO report. Before the Milestone III decision, and before fielding to 3rd Battalion, 75th Ranger Regiment at Fort Benning (also Army Rangers, Special Forces, airborne, air assault, and light infantry), the Javelin was subjected to limited parts of the five operational test and evaluation initiatives, as well as a portability operational test program (an additional test phase of the so-called Product Verification Test), which included live firings with the full-rate configuration weapon. Per initiatives and as a DT&E function, the Institute for Defense Analyses (IDA) and the Defense Department's Director of Operational Test and Evaluation (DOT&E) became involved in three development test activities, including: 1) reviewing initial operational test and evaluation plans; 2) monitoring initial operational test and evaluation; and 3) structuring follow-on test and evaluation activities. The results of these efforts detected problems (training included) and corrected significant problems which led to modified test plans, savings in test costs, and GAO satisfaction. The Javelin Environmental Test System (JETS) is a mobile test set for Javelin All-Up-Round (AUR) and the Command Launch Unit (CLU). It can be configured to functionally test the AUR or the CLU individually or both units in a mated tactical mode. This mobile unit may be repositioned at the various environmental testing facilities. The mobile system is used for all phases of Javelin qualification testing. There is also a non-mobile JETS used for stand-alone CLU testing. This system is equipped with an environmental chamber and is primarily used for Product Verification Testing (PRVT). Capabilities include: Javelin CLU testing; Javelin AUR testing; Javelin Mated Mode testing; Javelin testing in various environmental conditions; and CLU PRVT. The All-up-Round Test Sets include: extreme temperature testing; missile tracker testing (track rate error, tracking sensitivity); seeker/focal plane array testing (cool-down time, dead/defective pixels, seeker identification); pneumatic leakage; continuity measurements; ready time; and guidance sections (guidance commands, fin movement). The system consists of three main components - the Command Launch Unit, the Launch Tube Assembly and the missile itself. The gunner carries a reusable Command Launch Unit (in addition to the Launch Tube Assembly) more commonly referred to as a CLU (pronounced "clue") and is the targeting component of the two-part system. 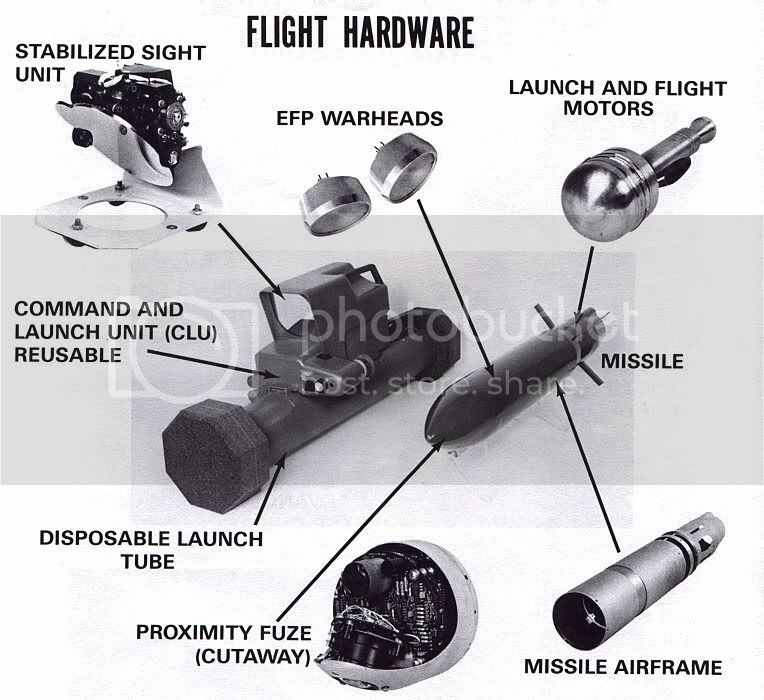 The CLU has three views which are used to find, target, and fire the missile and may also be used separately from the missile as a portable thermal sight. Infantry are no longer required to stay in constant contact with armored personnel carriers and tanks with thermal sights. This makes infantry personnel more flexible and able to perceive threats they would not otherwise be able to detect. In 2006, a contract was awarded to Toyon Research Corporation to begin development of an upgrade to the CLU enabling the transmission of target image and GPS location data to other units. The first view is a 4× magnification day view. It is mainly used to scan areas for light during daylight operation, because light is not visible in the thermal views. It is also used to scan following sunrise and sunset, when the thermal image is hard to focus due to the natural rapid heating and/or cooling of the Earth. The second view is the 4× magnification night view, and shows the gunner a thermal representation of the area viewed. This is also the primary view used due to its ability to detect infrared radiation and find both troops and vehicles otherwise too well hidden to detect. The screen shows a "green scale" view which can be adjusted in both contrast and brightness. The inside of the CLU is cooled by a small refrigeration unit attached to the sight. This greatly increases the sensitivity of the thermal imaging capability since the temperature inside the sight is much lower than that of the objects it detects. Due to the sensitivity this causes, the gunner is able to "focus" the CLU to show a detailed image of the area being viewed by showing temperature differences of only a few degrees. The gunner operates this view with the use of two hand stations similar to the control stick found in modern cockpits. It is from this view that the gunner focuses the image and determines the area that gives the best heat signature on which to lock the missile. The third field of view is a 12× thermal sight used to better identify the target vehicle. Once the CLU has been focused in WFOV, the gunner may switch to NFOV for target recognition before activating Seeker FOV. Once the best target area is chosen, the gunner presses one of the two triggers and is automatically switched to the fourth view; the Seeker FOV, which is a 9x magnification thermal view. This process is similar to the automatic zoom feature on most modern cameras. This view is also available along with the previously mentioned views, all of which may be accessed with press of a button. However, it is not as popular as a high magnification view takes longer to scan a wide area. This view allows the gunner to further aim the missile and set the guidance system housed inside the actual missile. It is when in this view that information is passed from the CLU, through the connection electronics of the Launch Tube Assembly, and into the missile's guidance system. If the gunner feels uncomfortable with firing the missile, he can still cycle back to the other views without having to fire the missile. When the gunner is comfortable with the target picture, he pulls the second trigger and establishes a "lock”. The missile launches after a short delay. The U.S. Army is developing a new CLU as an improvement over the Block I version. The new CLU is 70 percent smaller, 40 percent lighter, and has a 50 percent battery life increase. Features of the lightweight CLU are: a long-wave IR sensor; a high-definition display with improved resolution; integrated handgrips; a five megapixel color camera; a laser point that can be seen visibly or through IR; a far target locator using GPS, a laser rangefinder, and a heading sensor; and modernized electronics. Both of the gunner and the ammunition bearer carry a disposable tube called the Launch Tube Assembly, which houses the missile and protects the missile from harsh environments. The tube also has built in electronics and a locking hinge system that makes attachment and detachment of the missile to and from the Command Launch Unit a quick and simple process. The Javelin missile's tandem warhead is a HEAT type. This round utilizes an explosive shaped charge to create a stream of superplastically deformed metal formed from trumpet-shaped metallic liners. The result is a narrow high velocity particle stream that can penetrate armor. The Javelin counters the advent of explosive reactive armor (ERA). ERA boxes or tiles lying over a vehicle's main armor explode when struck by a warhead. This explosion does not harm the vehicle's main armor, but causes steel panels to fly across the path of a HEAT round's narrow particle stream, disrupting its focus and leaving it unable to cut through the main armor. The Javelin uses two shaped-charge warheads in tandem. The weak, smaller diameter HEAT precursor charge pushes through the ERA without setting it off, and punches a channel through it for the much larger diameter HEAT warhead, which then penetrates the target's primary armor. A two-layered molybdenum liner is used for the precursor and a copper liner for the main warhead. To protect the main charge from the explosive blast, shock, and debris caused by the impact of the missile's nose and the detonation of the precursor charge, a blast shield is used between the two charges. This was the first composite material blast shield and the first that had a hole through the middle to provide a jet that is less diffuse. A newer main charge liner produces a higher velocity jet. While making the warhead smaller, this change makes it more effective, leaving more room for propellant for the main rocket motor, and thus increasing the missile's range. Electronic arming and fusing, called Electronic Safe Arming and Fire (ESAF), is used. The ESAF system enables the firing and arming process to proceed, while imposing a series of safety checks on the missile. ESAF cues the launch motor after the trigger is pulled. When the missile reaches a key acceleration point (indicating that it has cleared the launch tube), the ESAF initiates a second arming signal to fire the flight motor. After another check on missile conditions (target lock check), ESAF initiates final arming to enable the warheads for detonation upon target impact. When the missile strikes the target, ESAF enables the tandem warhead function (provide appropriate time between the detonation of the precursor charge and the detonation of the main charge). Though the Javelin's tandem HEAT warhead has proven efficient at destroying tanks, most threats it was employed against in Iraq and Afghanistan were weapon crews and teams, buildings, and lightly armored and unarmored vehicles. To make the Javelin more useful in these scenarios, the Aviation and Missile Research, Development, and Engineering Center developed a multi-purpose warhead (MPWH) for the FGM-148F. While it is still lethal against tanks, the new warhead has a naturally fragmenting steel warhead case that doubles the effectiveness against personnel due to enhanced fragmentation. The MPWH does not add weight or cost and has a lighter composite missile mid-body to enable drop-in replacement to existing Javelin tubes. The Javelin F-model is planned to begin deliveries in early 2020. Most rocket launchers require a large clear area behind the gunner to prevent injury from backblast. To address this shortcoming, without increasing recoil to an unacceptable level, the Javelin system uses a soft launch mechanism. A launch motor using conventional rocket propellant ejects the missile from the launcher, but stops burning before the missile clears the tube. The flight motor is ignited only after a delay to allow for sufficient clearance from the operator. To save weight, the two motors are integrated with a burst disc between them; it is designed to tolerate the pressure of the launch motor from one side, but to easily rupture from the other when the flight motor ignites. The motors use a common nozzle, with the flight motor's exhaust flowing through the expended launch motor. Because the launch motor casing remains in place, an unusual annular (ring-shaped) igniter is used to start it; a normal igniter would be blown out the back of the missile when the flight motor ignited and could injure the operator. Since the launch motor uses a standard NATO propellant, the presence of lead beta-resorcinol as a burn rate modifier causes an amount of lead and lead oxide to be present in the exhaust; for this reason, gunners are asked to hold their breath after firing. In the event that the launch motor malfunctions and the launch tube is overpressurized—for example, if the rocket gets stuck—the Javelin missile includes a pressure release system to prevent the launcher from exploding. The launch motor is held in place by a set of shear pins, which fracture if the pressure rises too high and allow the motor to be pushed out the back of the tube. As a fire-and-forget missile, after launch the missile has to be able to track and destroy its target without the gunner. This is done by coupling an on-board imaging IR system (different from CLU imaging system) with an on-board tracking system. The gunner uses the CLU's IR system to find and identify the target then switches to the missile's independent IR system to set a track box around the target and establish a lock. The gunner places brackets around the image for locking. The seeker stays focused on the target's image continuing to track it as the target moves or the missile's flight path alters or as attack angles change. The seeker has three main components: focal plane array (FPA), cooling and calibration and stabilization. The seeker assembly is encased in a dome that is transparent to long-wave infrared radiation. The IR radiation passes through the dome and then through lenses that focus the energy. The IR energy is reflected by mirrors on to the FPA. The seeker is a two-dimensional staring FPA of 64×64 MerCad (HgCdTe) detector elements. The FPA processes the signals from the detectors and relays a signal to the missile's tracker. The staring array is a photo-voltaic device where the incident photons stimulate electrons and are stored, pixel by pixel, in a readout integrated circuits attached at the rear of the detector. These electrons are converted to voltages that are multiplexed out of the ROIC on a frame-by-frame basis. To function effectively, the FPA must be cooled and calibrated. In other applications, a CLU's IR detectors are cooled using a Dewar flask and a closed-cycle Stirling engine, but there is insufficient space in the missile for a similar solution. Prior to launch, a cooler mounted on the outside of the launch tube activates the electrical systems in the missile and supplies cold gas from a Joule-Thomson expander to the missile detector assembly while the missile is still in the launch tube. When the missile is fired, this external connection is broken and coolant gas is supplied internally by an onboard argon gas bottle. The gas is held in a small bottle at high pressure and contains enough coolant for the duration of the flight of approximately 19 seconds. The seeker is calibrated using a chopper wheel. This device is a fan of six blades: five black blades with low IR emissivity and one semi-reflective blade. These blades spin in front of the seeker optics in a synchronized fashion such that the FPA is continually provided with points of reference in addition to viewing the scene. These reference points allow the FPA to reduce noise introduced by response variations in the detector elements. The platform on which the seeker is mounted must be stabilized with respect to the motion of the missile body and the seeker must be moved to stay aligned with the target. The stabilization system must cope with rapid acceleration, up/down and lateral movements. This is done by a gimbal system, accelerometers, spinning-mass gyros (or MEMS), and motors to drive changes in position of the platform. The system is basically an autopilot. Information from the gyros is fed to the guidance electronics which drive a torque motor attached to the seeker platform to keep the seeker aligned with the target. The wires that connect the seeker with the rest of the missile are carefully designed to avoid inducing motion or drag on the seeker platform. The tracker is key to guidance/control for an eventual hit. The signals from each of the 4,096 detector elements (64×64 pixel array) in the seeker are passed to the FPA readout integrated circuits which reads then creates a video frame that is sent to the tracker system for processing. By comparing the individual frames, the tracker determines the need to correct so as to keep the missile on target. The tracker must be able to determine which portion of the image represents the target. The target is initially defined by the gunner, who places a configurable frame around it. The tracker then uses algorithms to compare that region of the frame based on image, geometric, and movement data to the new image frames being sent from the seeker, similar to pattern recognition algorithms. At the end of each frame, the reference is updated. The tracker is able to keep track of the target even though the seeker's point of view can change radically in the course of flight. To guide the missile, the tracker locates the target in the current frame and compares this position with the aim point. If this position is off center, the tracker computes a correction and passes it to the guidance system, which makes the appropriate adjustments to the four movable tail fins, as well as eight fixed wings at mid-body. This is an autopilot. To guide the missile, the system has sensors that check that the fins are positioned as requested. If not, the deviation is sent back to the controller for further adjustment. This is a closed-loop controller. There are three stages in the flight managed by the tracker: 1) an initial phase just after launch; 2) a mid-flight phase that lasts for most of the flight; and 3) a terminal phase in which the tracker selects the most effective point of impact. With guidance algorithms, the autopilot uses data from the seeker and tracker to determine when to transition the missile from one phase of flight to another. Depending on whether the missile is in top attack or direct attack mode, the profile of the flight can change significantly. The top attack mode requires the missile to climb sharply after launch and cruise at high altitude then dive on the top of the target (curveball). In direct attack mode (fastball), the missile cruises at a lower altitude directly at the target. The exact flight path which takes into account the range to the target is calculated by the guidance unit. A great familiarity of each control and swift operation needs to be achieved before the unit can be deployed efficiently. American troops are trained on the system at the Infantry School in Fort Benning, Georgia, for two weeks. The soldiers are taught basic care and maintenance, operation and abilities, assembly and disassembly, and the positions it can be fired from. Soldiers are also taught to distinguish between a variety of vehicle types even when only a rough outline is visible. The soldiers must accomplish several timed drills with set standards before being qualified to operate the system in both training and wartime situations. There are also smaller training programs set up on most army bases that instruct soldiers on the proper use of the system. At these courses, the training program might be changed in small ways. This is most commonly only minor requirements left out due to budget, the number of soldiers vs. simulation equipment, and available time and resources. Both types of training courses have required proficiency levels that must be met before the soldier can operate the system in training exercises or wartime missions. The portable system is easy to separate into main components and easy to set up when needed. Compared to more cumbersome anti-tank weapon systems, the difference is noticeable. For example, a TOW requires a heavy tripod stand, a bulky protective case for the thermal sight, a larger, longer launch tube, and much more time to assemble and prepare. The Javelin (although still heavy) is lighter than the other missiles and their necessary parts. Range of up to 4,750 m (15,600 ft) is another advantage of this missile. In UK Vehicle Tests on June 2016, Javelin missile scored 100% in five test firings from a UK-owned ground vehicle. Each Javelin flew distances between 1.2 and 4.3 kilometers (0.75 and 2.65 miles) and hit the ground target each time. The UK's live-fire tests "confirm Javelin’s greater than 94 percent reliability rate and demonstrate Javelin’s capability to engage targets from increased standoff distances on various platforms". Although the CLU's thermal imaging may hinder aiming, its thermal targeting allows the Javelin to be a fire-and-forget system. This gives the firer an opportunity to be out of sight and possibly moving to a new angle of fire, or out of the area, by the time the enemy realizes he is under attack. This is much safer than using a wire-guided system, where the firer must stay stationary to guide the missile into the target. Another advantage is the Javelin's power at impact. The missile's tandem shaped charge warhead is made to penetrate reactive armor. With the top attack mode, it has an even greater ability to destroy the tank because it can attack where most tanks are weakest. The soft launch capability of the Javelin allows it to have only a minimal backblast area. In addition to reducing the visible launch signature from the enemy, this enables the Javelin to be fired from inside structures with minimal preparation, which gives the Javelin advantages in urban fighting over the widely used AT4 (which has a large backblast area, although this is lessened in the AT4 CS). A large backblast area would seriously injure personnel if fired from inside an unprepared structure and may betray the location of the launch to enemy observers. The missile also has a greater range than the US ATGM it replaces, the M47 Dragon. The main drawback of the complete system (missile, tube, and CLU) is its 49.2 lb (22.3 kg) total weight. The system is designed to be portable by infantry on foot and weighs more than originally specified by the US Army requirement. Another drawback is the reliance on a thermal view to acquire targets. The thermal views are not able to operate until the refrigeration component has cooled the system. The manufacturer estimates 30 seconds until this is complete, but depending on the ambient temperature, this process may take much longer. Also, Javelin launchers and missiles are rather expensive. In 2002, a single Javelin command launch unit cost $126,000, and each missile cost around $78,000 (equivalent to $109,000 in 2018). The Javelin was used by the US Army, the US Marine Corps and the Australian Special Forces in the 2003 Invasion of Iraq on Iraqi Type 69 and Lion of Babylon tanks. In one short engagement, a platoon of U.S. special forces soldiers equipped with Javelins destroyed two T-55 tanks, eight armored personnel carriers, and four troop trucks. During the War in Afghanistan, the Javelin was used effectively in counter-insurgency (COIN) operations. Initially, soldiers perceived the weapon as unsuitable for COIN due to its destructive power, but trained gunners were able to make precision shots against enemy positions with little collateral damage. The Javelin filled a niche in U.S. weapons systems against DShK heavy machine guns and B-10 recoilless rifles—weapons like the AT4 and M203 were powerful enough, but had insufficient range; conversely, while medium and heavy machine guns and automatic grenade launchers had the range, they lacked the power; and heavy mortars, which had both a good range and more than enough power, lacked precision. The Javelin had enough range, power, and accuracy for dismounted infantry to counter standoff engagement tactics employed by enemy weapons. With good locks, the missile is most effective against vehicles, caves, fortified positions, and individual personnel. If enemy forces were inside a cave, a Javelin fired into the mouth of the cave would destroy it from the inside, which was not possible from the outside using heavy mortars. The psychological effect of the sound of a Javelin firing sometimes caused insurgents to disengage and flee their position. Even when not firing, the Javelin's CLU was commonly used as a man-portable surveillance system. During the al-Shaddadi offensive of the Syrian Civil War in February 2016, a Javelin was used to blow up a car bomb. In 2016, claims were posted on social media that the Syrian Kurdish People's Protection Units (YPG) may have received Javelin missiles. By June 2018, it was still unconfirmed if the YPG themselves were fielding Javelin missiles, although U.S. Army Special Forces units have been seen operating them in support of Syrian Democratic Forces (SDF) advances during the Deir ez-Zor campaign in the Middle Euphrates River Valley. A Norwegian soldier with the FGM-148 Javelin. Czech Republic: Purchased 3 launchers and 12 missiles for its special forces (intended for use in Afghanistan). An additional order totalling US$10.21 million was placed in December 2015 for an unknown number of missiles and launchers. Estonia: 80 CLU (with option for additional 40) and 350 missiles purchased from the United States. In service from 2016. France: 76 launchers and 260 missiles for use in Afghanistan. Was replacing MILAN anti-tank missile, no follow-on order in favor of the Missile Moyenne Portée (MMP). Georgia: 72 Launchers and 410 missiles. FMS sale to the Georgian military consisting of 410 Javelin Missiles, and 72 Javelin Command Launch Units (CLUs) includes 2 Javelin Block 1 CLUs to be used as spares was approved for US$75 million. Ireland; Irish Army, replaced MILAN anti-tank missile. Jordan: 30 launchers and 116 missiles were received in 2004, and another 162 JAVELIN Command Launch Units (CLUs), 18 Fly-to-Buy Missiles, 1,808 JAVELIN Anti-Tank Guided Missiles and other support equipment was ordered in 2009. The estimated cost is $388 million. Lithuania: 40 launchers. The first European Country accuired system (2001). In December 2015 DSCA approved for a possible Foreign Military Sale to Lithuania for another 220 missiles and 74 CLUs for $55 million. Malaysia: 60 launchers on order. Norway: 100 launchers and 526 missiles. Delivered from 2006, in use from 2009. In 2017 Norwegian authorities started the process of finding a replacement anti-tank weapon, in order to counter new types of heavy tanks equipped with active protection systems capable of defeating missiles like the Javelin. Qatar: In March 2013, Qatar requested the sale of 500 Javelin missiles and 50 command launch units. The deal was signed in March 2014. Taiwan: In 2002, Taiwan bought 360 Javelin missiles and 40 launcher units for $39 million. The contract also included training devices, logistics support, associated equipment and training. In 2008, the United States issued a congressional notification for the sale of a further 20 launchers and 182 more missiles. Ukraine: In 2018 Ukraine purchased 210 missiles and 37 launchers. No details beyond the confirmation of the delivery (on 30 April 2018) have been provided. 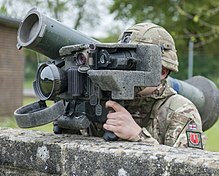 United Kingdom: In January 2003, the UK Ministry of Defence announced that it had decided to procure Javelin for the Light Forces Anti-Tank Guided Weapon System (LFATGWS) requirement. It entered UK service in 2005 replacing the MILAN and Swingfire systems. United States: In 2003, the United States General Accounting Office (GAO) reported that the army could not account for 36 Javelin command launch units totaling approximately $2.8 million. The New York Times later reported supply chain problems at military armories and warehouses in 2004 and expressed concerns of weapons falling into enemy hands. India: India had proposed a deal to buy some systems off-the-shelf with a larger number to be license manufactured locally through "transfer of technology" but this was not acknowledged by the United States. Instead, in September 2013, the U.S. offered co-development of a newer variant of the Javelin which was, this time, not acknowledged by India. Eventually, the plan to purchase Javelins was "shelved" and in October 2014, India chose to buy the Israeli Spike missile system. ^ a b "Georgia reveals its first US-made Javelin anti-tank missile systems". 2 May 2018. The Javelin has been combat proven in Afghanistan and Iraq by U.S. and allied soldiers, Marines and Special Forces. ^ "La bataille de Raqqa, en français dans le texte" (in French). 15 November 2016. ^ "Department of Defense Fiscal Year (FY) 2019 Budget Estimates" (PDF). US Department of the Army. February 2018. Retrieved 10 November 2018. ^ a b c Raytheon/Lockheed Martin Javelin Joint Venture Awarded Contract for 2,100 F-Model Missiles, Marking Initial Full-Rate Production. Lockheed Martin. 30 January 2019. ^ "Wayback Machine" (PDF). 26 September 2013. ^ a b c d e f g h i j "Javelin Portable Anti-Tank Missile". Army Technology. Retrieved 25 December 2014. ^ "Javelin Missile Hits Targets Beyond Current Maximum Range During Tests". Archived from the original on 2016-08-15. Retrieved 2016-06-21. ^ ARG. "Javelin Anti-Tank Guided Missile". Military-Today.com. Retrieved 2017-05-30. ^ a b John Pike. "Javelin Antitank Missile". Globalsecurity.org. Retrieved 2017-05-30. ^ "Javelin Antitank Missile". Archived from the original on 2016-03-04. Retrieved 2016-02-08. ^ "Javelin". Web.archive.org. Archived from the original on 2001-02-15. Retrieved 2017-05-30. ^ "262 Phase I Selections from the 06.2 Solicitation". Archived from the original on 2007-09-27. ^ a b "Close Combat Missile Systems Overview to Precision Strike Association" (PDF). Archived from the original (PDF) on 2014-04-07. Retrieved 2014-03-30. ^ Adamowski, Jaroslaw. "Javelin Missile Scores 100 Percent in UK Vehicle Tests". Defensenews.com. Retrieved 2017-05-30. ^ "Raytheon/Lockheed Martin FGM-148 Javelin". Designation-systems.net. 2005-04-07. Retrieved 2017-05-30. ^ "Javelin Medium Anti-armor Weapon System". Inetres.com. Retrieved 2017-05-30. ^ Thom Shanker, "THE STRUGGLE FOR IRAQ: COMBAT; How Green Berets Beat the Odds at an Iraq Alamo", The New York Times, September 22, 2003. ^ "Javelin in Afghanistan: The Effective Use of an Anti-Tank Weapon for Counter-Insurgency Operations" (PDF). Archived from the original (PDF) on 2016-03-04. Retrieved 2016-02-08. ^ "EXCLUSIVE: Interethnic coalition takes on the IS group in Syria". France 24. 22 April 2016 – via Youtube. ^ Gibbons-Neff, Thomas (2016-02-23). 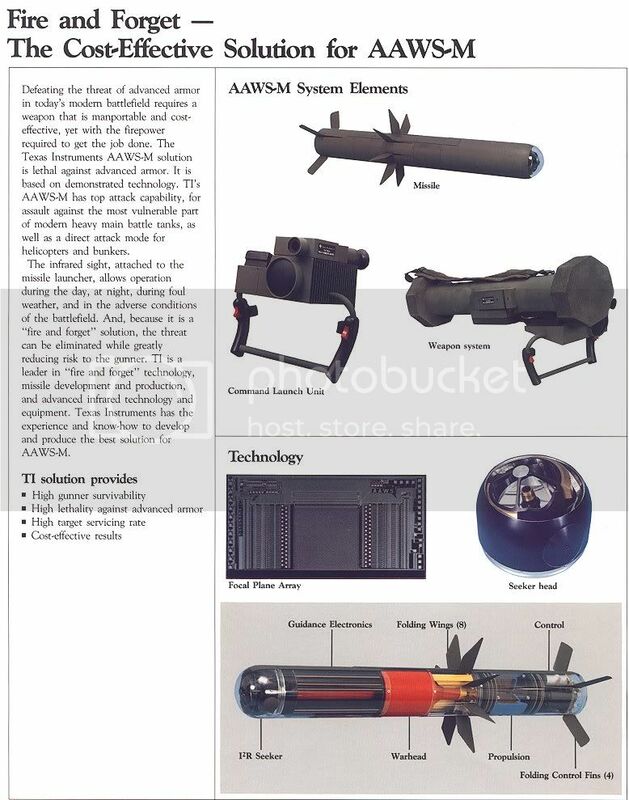 "This highly advanced U.S.-made anti-tank missile could now be on Syria's frontlines". The Washington Post. ^ The World Defence Almanac 2010 page 418 ISSN 0722-3226 Monch Publishing Group. Australia was one of the first countries that the US government gave "unrestricted" permission for the export of the Javelin. ^ "Bahrain Requests 160 Javelins & 60 CLUs". Archived from the original on 2007-03-24. Retrieved 2016-02-08. ^ Martin, Guy. "Botswana - defenceWeb". www.defenceweb.co.za. ^ "Czech Republic to buy Javelin ATGWs | IHS Jane's 360". Janes.com. Retrieved 2015-12-07. ^ "Eesti saab Javelini tankitõrjesüsteemid järgmisel aastal". www.postimees.ee (in Estonian). Archived from the original on 2018-01-19. Retrieved 2018-01-19. ^ "Armor: Missing Milans In Gaza". Strategypage.com. 2012-10-21. Retrieved 2017-05-30. ^ "The U.S. Congress approved the sale of the Georgia anti-tank systems "javelin"". ^ Bisaccio, Derek (4 April 2019). "Georgia Receives All Javelin Missile Systems". Forecast International. Retrieved 5 April 2019. ^ Jones, Richard D. Jane's Infantry Weapons 2009/2010. Jane's Information Group; 35 edition (January 27, 2009). ISBN 978-0-7106-2869-5. ^ "Jordan to buy Javelin anti-tank missiles from USA of worth $388 million". Archived from the original on 2012-03-06. Retrieved 2016-02-08. ^ John Pike (2015-12-18). "Lithuania-Javelin Missiles and Command Launch Units". Globalsecurity.org. Retrieved 2017-05-30. ^ Abas, Marhalim (2018-09-12). "Shepard Says Malaysia Bought Javelins, Updated". Malaysian Defence. Retrieved 2018-09-19. ^ Marcus, Jonathan (30 May 2017). "Should Russia's new Armata T-14 tanks worry Nato?". BBC News. Retrieved 30 May 2017. ^ "Kingdom of Saudi Arabia – JAVELIN Missiles | The Official Home of the Defense Security Cooperation Agency". Dsca.mil. 2010-11-18. Retrieved 2017-05-30. ^ "Taipei Economic and Cultural Representative Office in the United States – JAVELIN Guided Missile Systems" (PDF). DSCA. 2008-10-03. Archived from the original (PDF) on 2011-07-16. Retrieved 2008-10-05. ^ a b "U.S. Confirms Delivery Of Javelin Antitank Missiles To Ukraine". RadioFreeEurope/RadioLiberty. ^ "Ukraine – Javelin Missiles and Command Launch Units - The Official Home of the Defense Security Cooperation Agency". www.dsca.mil. ^ "Javelin Medium Range Anti-tank Guided Weapon". Archived from the original on 10 January 2013. Retrieved 2011-10-08. ^ Abate, Tom (2003-05-18). "Military waste under fire / trillion missing – Bush plan targets Pentagon accounting". The San Francisco Chronicle. ^ Schmitt, Eric; Thompson, Ginger (2007-11-11). "Broken Supply Channel Sent Arms for Iraq Astray". The New York Times. Retrieved 2010-05-02. ^ Pandit, Rajat (2010-08-17). "India to order large number of Javelin anti-tank missiles from US". The Times Of India. ^ Pandit, Rajat (2012-11-29). "Israel pips US in anti-tank guided missile supply to India". The Times Of India. ^ RAGHUVANSHI, VIVEK (16 August 2014). "Too Early To Assess Indo-US Defense Ties". Defensenews.com. Gannett. Retrieved 16 August 2014. 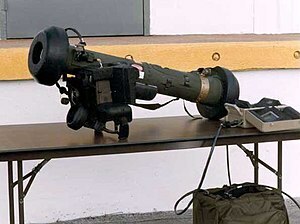 Wikimedia Commons has media related to FGM-148 Javelin.